This side dish can be prepared a couple of days ahead of time and refrigerated. Place the potatoes on a cookie sheet. 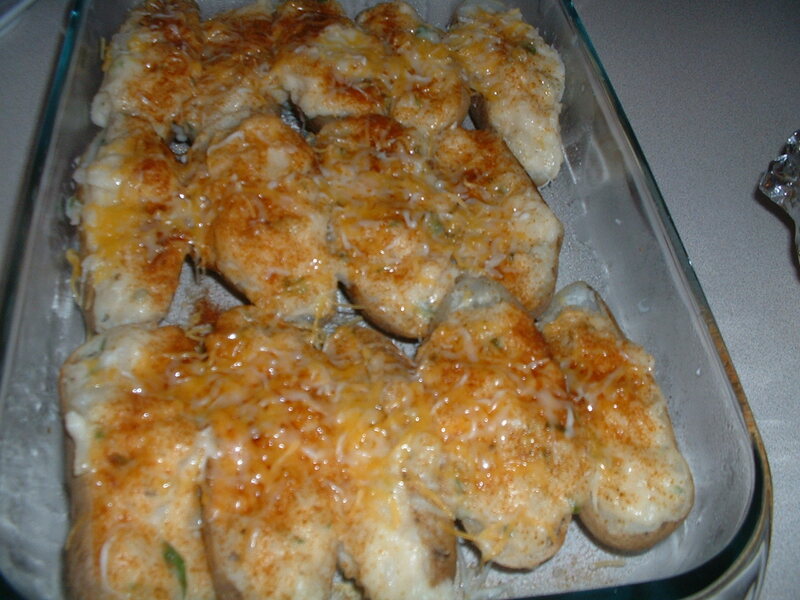 Bake the potatoes in the preheated oven for one hour or until a fork can easily pierce the skin of the potatoes. Let the potatoes cool for one hour. Slice the potatoes in half lengthwise. Scoop out the potato flesh making sure to leave about ¼ inch of the flesh remaining on the skins. Place the scooped out potato flesh in a pot. To the pot, add a cup of the cheddar cheese, the scallions, the garlic powder, the butter, the yogurt, the chicken broth, the sea salt, the black pepper, and the red cayenne pepper. Cook on medium high heat while mashing until all of the ingredients are well blended. Taste and add more sea salt and/or pepper, if desired. Remove the pot from the heat. Fill each potato shell evenly with the mashed potato mixture. Sprinkle paprika on top of the potatoes. Add the remaining two tablespoons of the cheddar cheese evenly over the top of each potato. When you are ready to cook the potatoes, preheat the oven to 350 degrees. Bake for one hour. Into a saucepot, add the olive oil, onions, garlic, oregano, a teaspoon of red pepper flakes, and five teaspoons of sea salt. Cook on medium heat for four minutes stirring frequently. Add the tomato paste and the red wine. Cook for an additional minute while stirring frequently. Add the mushrooms. Stir well. Add the crushed tomatoes with the can juice and scrape the bottom of the pot to loosen the brown bits that have accumulated. Turn the heat down to low. Tie the basil, parsley, thyme, and rosemary together with cooking twine and drop this herb bundle into the sauce. Make sure that the herb bundle is submerged. Simmer for 1-1/2 hours and then remove the herb bundle. Taste the sauce and add more sea salt and/or red pepper if desired. Cook the lasagna noodles in a pot of salted boiling water for 5 minutes. Remove the lasagna noodles and drain well. Spread the noodles out on a sheet pan so that they do not stick together. Let them cool. Squeeze the thawed frozen spinach well to get out as much water as possible. Put the spinach in a mixing bowl. Add the ricotta cheese, two tablespoons of Romano cheese, the garlic powder, a teaspoon of sea salt, the black pepper, and ¼ teaspoon of crushed red pepper flakes. Fold all of the ingredients together. Beat the egg in a separate bowl. Add the beaten egg to the cheese mixture. Mix well to incorporate. Spread enough sauce to cover the bottom of a lasagna pan. Add four of the lasagna noodles to the top of the sauce. The noodles should lie flat on top of the sauce. 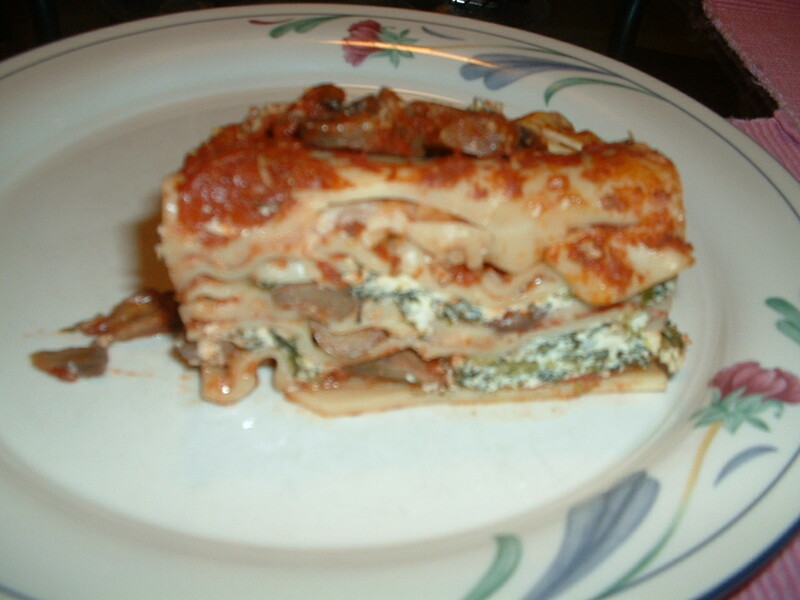 Spread a small amount of the sauce evenly on top of the lasagna noodles. Note: Do not drench the noodles with sauce. 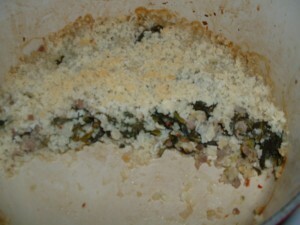 Spread the ricotta cheese and spinach mixture evenly over the noodles. Top the ricotta cheese with three of the lasagna noodles. Spread more sauce on top of the second layer of noodles. Cover the second layer of noodles evenly with mozzarella cheese. Repeat these steps until all of cheese is used up ending with a final layer of noodles with no cheese topping. Spread the rest of the mushroom and tomato sauce on top of the last layer of noodles. Sprinkle the remaining Romano cheese on top of the sauce. Note: add more Romano cheese if desired. Preheat oven to 350 degrees. Bake the lasagna for one hour. Let the lasagna rest at room temperature for 15 minutes before cutting into squares. Add the orange juice to a mixing bowl. While whisking, slowly drizzle in the olive oil. Continue to whisk until the mixture thickens slightly. Taste and add sea salt and black pepper, as needed. Toss with green leaf or romaine lettuce. Top with roasted walnuts and scallions for added flavor and crunch. Into a sauté pan, add the olive oil, lemon zest, garlic, red pepper flakes, and the sea salt. Cook on medium heat for 2 minutes. Add the cannellini beans. Stir to coat the beans with the garlic, lemon zest, and the olive oil. Continue to cook on medium heat for 4 minutes stirring frequently. Reduce the heat to low. Add the chicken broth and the parsley. Stir to incorporate. Turn the heat off and let the mixture cool for 10 minutes. Put the mixture into a food processor. Pulse until smooth. Taste and add more sea salt and/or crushed red pepper flakes, if desired. Serve with chips or toasted French bread. This recipe is great for using up leftover Thanksgiving turkey and turkey stock. It transforms the turkey into a completely different tasting dish. Start the gumbo by making a roux. Add the vegetable oil and the flour to a Dutch oven and put it on medium heat. Whisk the flour and the oil together to get out any lumps. Cook on medium heat stirring constantly with a wooden spoon for 25 minutes until the roux is a dark chocolate brown. Reduce the heat to low. Add the onions to the roux and cook for two minutes while stirring. Turn off the heat. Add the andouille sausage, the celery, the green bell pepper, the garlic, the cayenne pepper, and the sea salt. Cook for 4 minutes while stirring. Add the Worcestershire sauce and the tomato puree. Cook for two minutes while stirring. Turn the heat up to medium high and add six cups of the stock while stirring. Continue to stir until the stock is well incorporated with the other ingredients. When the mixture begins to boil, the roux will be at its full thickening power. If the gumbo appears too thick, add some more stock a little at a time until the desired consistency is achieved. Reduce the heat to low. Add the bay leaf and the thyme sprigs. Put the lid on the pot about ¾ of the way. Simmer while stirring occasionally for 45 minutes. After 45 minutes, remove the bay leaf and the thyme sprigs. Taste the gumbo and add more sea salt and/or cayenne pepper if desired. Add the cubed turkey to the gumbo. Turn the heat off and cover the pot to keep the gumbo warm. Serve with white rice. Garnish with the chopped parsley and the chopped scallions. This is a quintessential autumn dish especially for Thanksgiving dinner. It is simple to prepare and delicious. Combine the balsamic vinegar, the olive oil, the sea salt, and the black pepper in a large mixing bowl. Whisk until the mixture is well blended and thickened slightly. Add the butternut squash. Mix well so that all of the pieces get coated with the dressing. 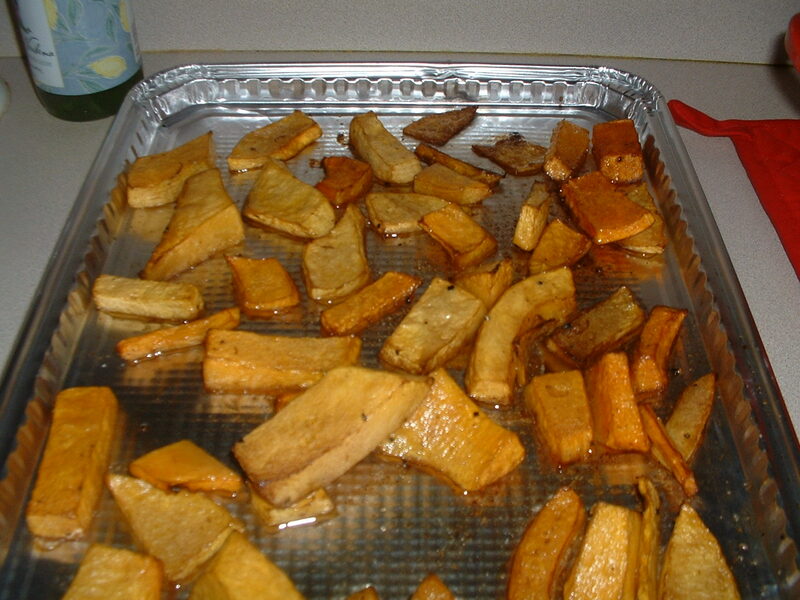 Spread the butternut squash pieces out evenly on a baking sheet. Roast in the preheated oven for about one hour until the squash is tender and browned. A pinch of saffron goes a long way. This is a good thing because it is one of the most expensive spices on the planet. Combine the chicken stock and the saffron in a small pot. Put on low heat for at least one hour. 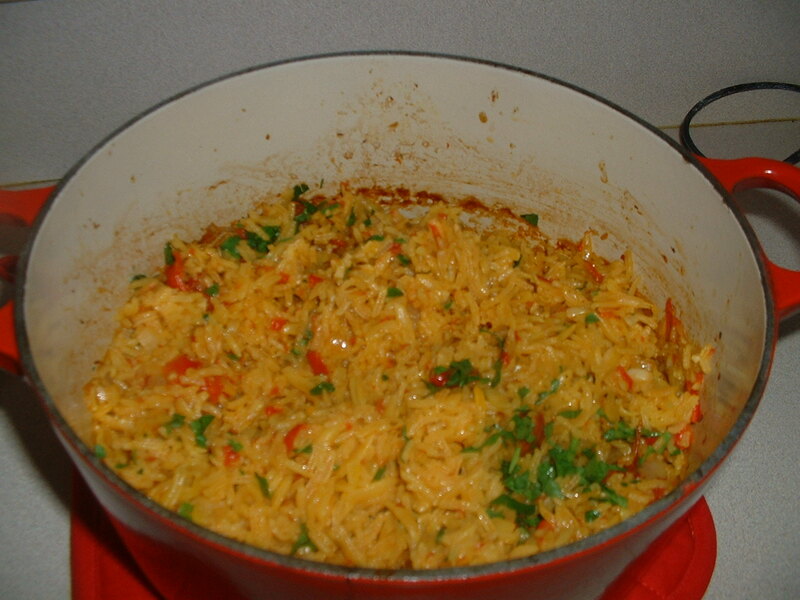 Mix the basmati rice and the orzo well in a bowl and set it aside. Into a Dutch oven, add the olive oil, the roasted red pepper, the roasted tomato, the garlic, the onion, the oregano, the paprika, the sea salt, and the crushed red pepper flakes. Cook on medium high heat for 5 minutes while stirring frequently. Add the orzo and the rice. Stir well so that the rice and orzo mixture gets coated with all of the ingredients. Add the saffron infused chicken stock. Stir one more time. Bring the mixture to a boil. Cover the Dutch oven and place it in the oven for 30-35 minutes until the rice and the orzo have absorbed all of the liquid. Fluff the rice pilaf with a fork. Garnish with the fresh parsley and serve. Combine the maple syrup, the walnuts, the garlic, the soy sauce, the sea salt, and the black pepper in a mixing bowl. Whisk well. Add the salmon fillets to the mixture. 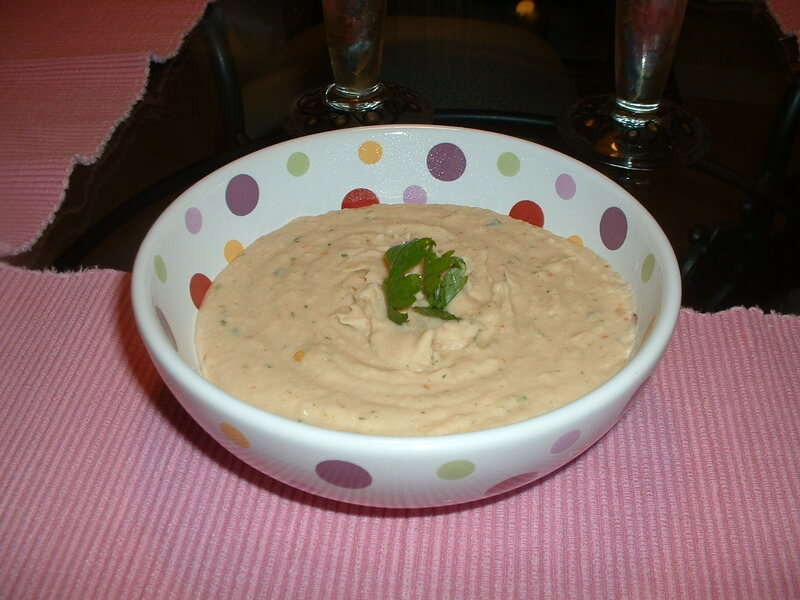 Place the mixing bowl with the salmon and the marinade in the refrigerator for one hour. 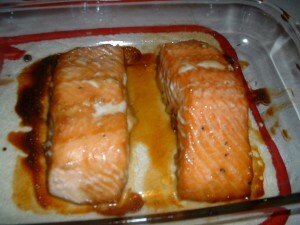 Take the salmon fillets out of the marinade and put them in a baking dish. 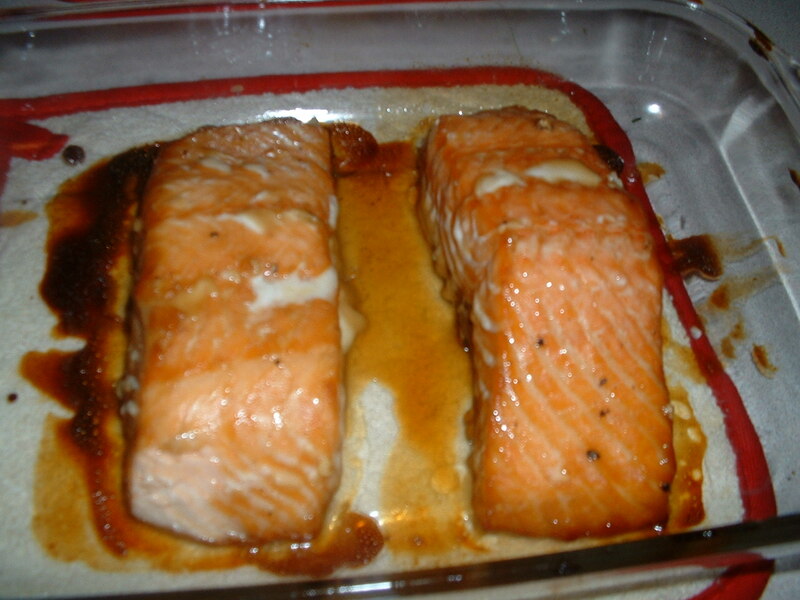 Bake the salmon in the preheated oven for 45 minutes. Serve with fresh lime wedges. Combine the fennel seeds, the Spanish paprika, the oregano, the crushed red pepper flakes, and the sea salt in a coffee grinder. Grind into a smooth powder. Spread the spice rub out evenly on a flat plate. Coat one side of the scallops with the spice mixture by placing the scallop onto the spice rub (that had been spread out on the plate). The spice powder should easily stick to the moist scallops. Place the scallops on a plate with the spice side up. Heat a 12-14 inch non-stick skillet on medium high heat for three minutes. Add the butter and the olive oil. Make sure that the butter and the olive oil evenly coat the sauté pan. Add the scallops with the spice side down allowing equal space in between each one. 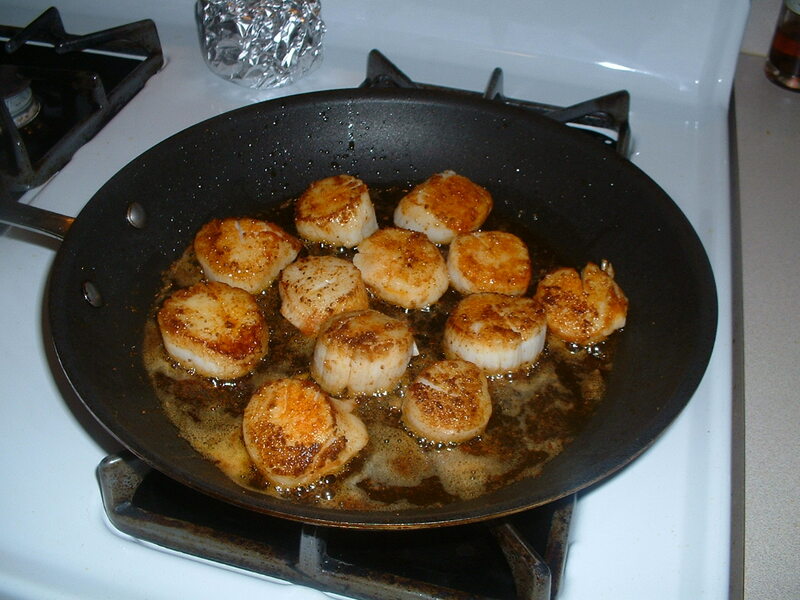 Cook the scallops for about five minutes without touching until a dark brown crust forms. Turn the scallops over and cook the other side for three minutes. Turn off the heat. Serve with fresh lemon wedges.